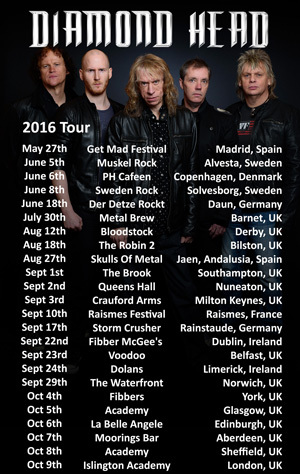 DIAMOND HEAD are set to return to North American for their longest tour in their 40-year career. The headline run will feature songs that span their extensive recording catalog including their self-titled new album set for North American release on June 24. Recorded at Vigo Studios in Birmingham, Diamond Head is the first album to feature new vocalist Rasmus Born Anderson and ends an eight-year silence for the New Wave of British Heavy Metal (NWOBHM) legends. Prior to 2014, the thought of a new album was bleak as guitarist and band founder Brian Tatler previously revealed. “I had no interest in doing another record but after working with Ras on the 2014 European tour that suddenly changed. I wanted to make a record with him. He’s a confident singer and he’s not trying to fill anyone’s shoes.” Recording of the album commenced last July with the band and engineer Adam Beddow at the helm. Tatler notes, “I gave Rasmus some music to listen to last January. He selected songs or riffs that he wanted to work on and we began rehearsing. We whittled things down to fourteen songs by April.” Eleven songs were selected in the end for the album; all mixed by Dave Nicholls and mastered by John Davis at London’s Metropolis. DIAMOND HEAD are considered one of NWOBHM’s early members. Formed in 1976, their songs influenced a slew of early 80’s thrash metal bands, in particular METALLICA who recorded the band’s “Am I Evil” as a b-side to their 1984 "Creeping Death" single and again included on the band’s multi-platinum 1998 covers album Garage Inc. Tatler joined members of METALLICA, MEGADETH, SLAYER and ANTHRAX at the 2011 Sonisphere Festival. METALLICA drummer addressed the crowd saying, “if it wasn’t for Brian Tatler, there’s a pretty good chance none of us would be here tonight.” Later speaking about the event Tatler said, “if it wasn’t for METALLICA, DIAMOND HEAD would not have had this second wind.” METALLICA would record three additional DIAMOND HEAD songs – “Helpless” (Garage Days, 1987), “The Prince” (“One" Single b-side, 1989), “It’s Electric”,/B> (Garage Inc., 1998). In addition to the new album, Dissonance Productions will issue for the first time in North America the band's 2005 album All Will Be Revealed and the 2007 album What's In Your Head. Both will be released on July 1.